The Dunphy-Pritchett-Tucker clan reunites on ABC'S "Modern Family." American middle-class families are making less money across the country. Since 1999, median incomes have dropped in all but two states. It's no wonder, then, that earning and saving enough to afford a down payment on a home, or to retire, for example, is getting more difficult. "Many Americans in this demographic wonder how much money they can really save," personal-finance website SmartAsset points out. But some states are better for the middle class than others. In South Dakota and Vermont, incomes have actually increased. And states on the West Coast are generally better than those in the Midwest, the South or on the East Coast, according to SmartAsset, which defines middle-class households as those with an annual income between $35,000 and $100,000. To pinpoint where life is easiest for middle-class families, researchers gathered U.S. Census Bureau and Bureau of Labor Statistics data for all 50 states and Washington, D.C., in eight key metrics: percent of middle-class households, percent of below middle-class households, number of new middle-class jobs, percent growth in middle-class jobs, effective property tax and income tax rates, median home value and homeownership rate. The researchers ranked each state in each metric and assigned a score based on those rankings. The state with the best average ranking received a "100" and the state with the worst ranking received a "0." The No. 1 ranked state of Utah touts a 55 percent job growth rate and 70 percent homeownership rate. That's compared compared to D.C., one of the most expensive places to live in the U.S., with minus 3 percent job growth and a 39 percent homeownership rate. "Go West," says SmartAsset. 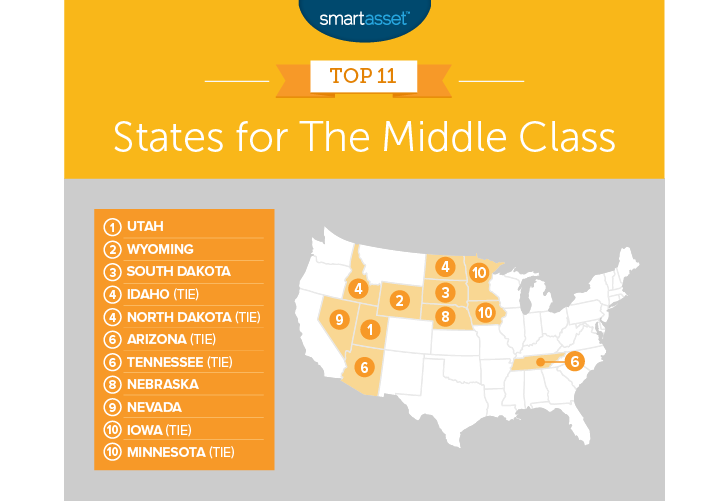 "The best states for the middle class are clustered in the Western part of the country." Meanwhile, it's "tough in the Northeast. With high tax burdens, low home-ownership rates and unaffordable housing," five of the lowest-ranked states are New York, New Jersey, Connecticut, Massachusetts and Rhode Island. These findings underline the point that, if you're trying to balance your budget, where you live matters. But no matter where you're located, living within your means and employing some common-sense budgeting techniques can help you stretch your money further. Here are a few simple ways to get started.